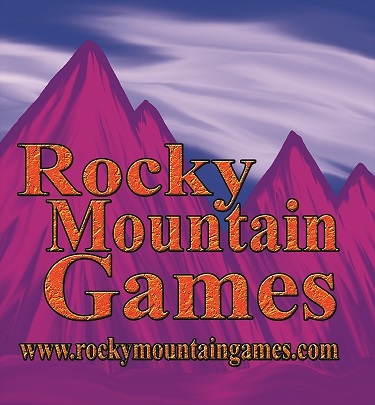 Founded in 2013 by Dustin Hatchett and Timothy Heath; Rocky Mountain Games will develop, design and bring to market though various channels Board Games, Card Games and Role Playing Games. The founding members have a combined sixty years of experience in the Gaming Industry from all levels of the supply chain; from design, distribution, retail sales and convention/trade show promotion. 'ZERO Hour: Cyberspace' - The Dice Manipulation and Strategy Game about Cyber Threats in the 21st Century. 2-4 players 30-60 mins with 24 sided dice. 'Belter 2176' - Prospecting and Plundering the Asteroid Belt in 2176. 2-6 Players 45 mins per player using an innovative movement system that replicates inertia. 'Destiny of the West' - The destiny of a country lies before your every move. 3-6 Players a truly unique area control and negotiation game. 'B-17: Mission Critical' - Can you bring your crew of ten men home? - 2-6 Players play a campaign of 20,25 or 35 missions during 1943-1945 with "The Mighty Eighth". 18xx Fantasy - Game in development using the Iron Kingdoms setting by Privateer Press.